Scientists at the California Institute of Technology have discovered evidence of a giant planet tracing a bizarre, highly elongated orbit in the outer solar system. 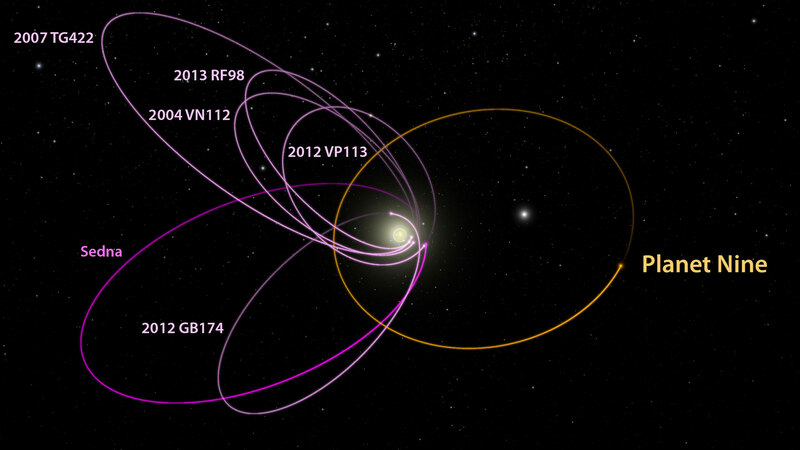 The newly discovered object, which the researchers have nicknamed Planet Nine, has a mass about 10 times that of Earth and orbits about 20 times farther from the sun on average than does Neptune (which orbits the sun at an average distance of 2.8 billion miles). In fact, it would take this new planet between 10,000 and 20,000 years to make just one full orbit around the sun. Fairly quickly Batygin and Brown realized that the six most distant objects from Trujillo and Sheppard’s original collection all follow elliptical orbits that point in the same direction in physical space. That is particularly surprising because the outermost points of their orbits move around the solar system, and they travel at different rates. And indeed Planet Nine’s existence helps explain more than just the alignment of the distant Kuiper Belt objects. It also provides an explanation for the mysterious orbits that two of them trace. The first of those objects, dubbed Sedna, was discovered by Brown in 2003. Unlike standard-variety Kuiper Belt objects, which get gravitationally “kicked out” by Neptune and then return back to it, Sedna never gets very close to Neptune. A second object like Sedna, known as 2012 VP113, was announced by Trujillo and Sheppard in 2014. Batygin and Brown found that the presence of Planet Nine in its proposed orbit naturally produces Sedna-like objects by taking a standard Kuiper Belt object and slowly pulling it away into an orbit less connected to Neptune. Where did Planet Nine come from and how did it end up in the outer solar system? Scientists have long believed that the early solar system began with four planetary cores that went on to grab all of the gas around them, forming the four gas planets—Jupiter, Saturn, Uranus, and Neptune. Over time, collisions and ejections shaped them and moved them out to their present locations. “But there is no reason that there could not have been five cores, rather than four,” says Brown. Planet Nine could represent that fifth core, and if it got too close to Jupiter or Saturn, it could have been ejected into its distant, eccentric orbit. In terms of understanding more about the solar system’s context in the rest of the universe, Batygin says that in a couple of ways, this ninth planet that seems like such an oddball to us would actually make our solar system more similar to the other planetary systems that astronomers are finding around other stars. First, most of the planets around other sunlike stars have no single orbital range—that is, some orbit extremely close to their host stars while others follow exceptionally distant orbits. Second, the most common planets around other stars range between 1 and 10 Earth-masses. 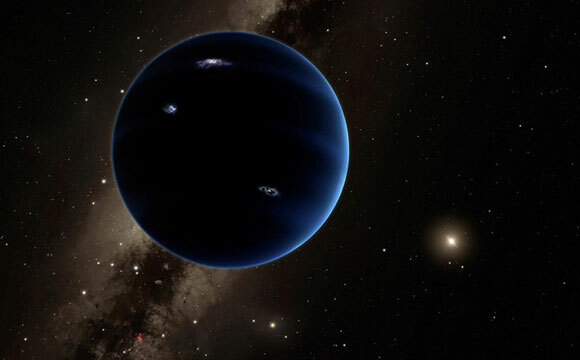 2 Comments on "Planet Nine – Astronomers Find Evidence of a Real Ninth Planet in Our Solar System"
This seems to be one of the Kuiper Belt Objects, which is large enough comparable to earth,unlike Halley’s comet which circles sun once in every 86 years. The orbit is highly eccentric and hence it takes about 20000 years to complete one orbit around the Sun. We know many comets take about 100000 to 200000 years for a detour around the Sun. This Planet Nine may not be complete with solar system census. Who knows that after thousands of years one may come across another Kuiper Belt Object like this Planet slowly and the census will never be complete even then. If we extend the intergalactic domain we may still come across many such ‘stones’ inter-spread until we reach the next neighboring star, no doubt. The atmosphere will be no better than a comet like ice and rock putrefied with sublimation of icy solid into gas. Thank You. This means the brightness of our sun will also be controlled by the 9th planes rotation whether this will be controlling the heax jets of Satun in turn Does it vary the Suns genetic cusp slow ly as suspected by Astrogeneticist? Several DNA repair mechanisms comprise relatively simple single-step enzyme reactions catalyzed by monomeric proteins which directly reverse base damage to DNA (). In some cases these reversal reactions require specific cofactors, in some cases not. UV rays source that activate any gene that oscillate between frequency selective transfer polygon in a peculiar way lose its strength as the Lobochesky Graffe point vector graces through pair of complex root power forming a Quadratic equation that seek roots in complex trigonometrical form that complex root pinpointing a desert modulus as the root repeatedly for negative gain that oscillate between positive and negative as descending order of moduli but a gain observed in pi/3 and 2/pi oscillations seems to be a very important polygon theory of transfer factor that picks up resonance and anti resonance along the plane of genetic hologram a UV rays source that vary the UV point vector differently. The result of a triplet of twins with each “twin” oriented at 120 degree triplet trilling valley that will be generated along uv ray convergence .The hexagonal polygon corners at which electron spin in opposite directions changes the twinned triple phases vary at pi phases differentials forming a square polygon.Pointing vector with 2/3 cyclic oscillation always seems to stabilize the genetic stability where as a pi/2 shifts brings out sudden changes. The activation seems to be the least as the genetic gain seems to be declined in pi/6 ,pi/2.pi/4 phases a 2,4,7,10 numbering may be given on these selective planes along transformation scaling ratioas typically any differential of any polynomial ratiowith poles as w-w1 and xeros with w-w2 xeros forming a a gin amplifier as F(W) as M transfer function as polynomial gain.in which s is analogous to frequency as a complex root number s+sigmaw a positive frequency subjected to sinusoidal growing and declineof exponential transient observed as power multiplier on paired roots of roots Labochesky-Graffe point vector.